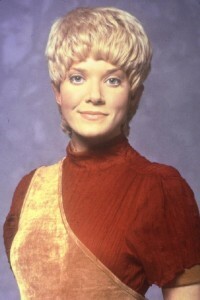 Cast as Kes in STAR TREK: VOYAGER, Jennifer Lien has a wealth of admirers. Gary Graham who guest starred with Lien in the "Cold Fire" episode, is one of them. "I told Jennifer," admitted the ALIEN NATION star, "that she has the single sexiest voice in Hollywood. Every time she speaks, it's like ear honey." And she's refreshingly grateful to a supportive public: "The fans have such great questions. The viewers notice things that I have no idea about. Conventions are always enlightening in that way. They want to know about the age thing. They're interested in the relationship between the doctor and Kes, and the relationship with Neelix." Lien's character, Kes, is an Ocampa, an alien life form with a five-year lifespan; but the actress insists this lack of longevity is an asset. "I like Kes," grins Lien, "She's strong and curious and intelligent and I like that a lot. We've developed the character and these traits, as well as other things - the fears and the inhibitions and the worries, that we all have. When you have a lot of that, you have diversity in the character and diversity is good. It gives an actor a challenge." Kes has been studying medicine under the tutelage of the ship's doctor (Robert Picardo). Whether their rapport is platonic or passionate has fueled much speculation: "There are a lot of different ways to look at the relationship between Kes and the doctor, and I think that's the point. It's possible. There are a lot of possibilities in a hug, as innocent as it may be; there are a lot places to go from there. Praising Picardo's improvisational aptitude, she notes, "I'll be standing there thinking about the scene and he'll say, 'Why don't we--', and I'll be like 'Oh! Okay!' Most of the times, it flies!" "I think all of Kes' options are really interesting, whether she furthers her development with botany or medicine, or other potential careers she could pursue...any of the possibilities would be fine." Viewers have noticed a humorous tension between Kes and her onscreen boyfriend, with Neelix acclimating himself to the attention that his beautiful "better half" draws from Voyager shipmates: "I think Kes and Neelix need to explore some issues of trust. I think jealousy is getting to be minimal. The character is learning, and I don't think it's going to be emphasized as much. There's not any need to play on that to any extent, because when it becomes too obsessive, it becomes scary--and I don't think that's what the character Neelix is all about." The series' sci-fi roots notwithstanding, Lien resists worry about pigeonholing: "Working on the show, you have your drama...you have your comedy...you have your romance. All those elements are there in every story. With STAR TREK you also add science and the unknown--a lot of the unknown. "Visually, it's different; the makeup, the hair, the wardrobe. But as far as being typecast, you don't have to be! Who says you have to be? It's a big world and not everybody knows who you are. Some people don't even watch TV. Right now is what I'm doing--right now."